Founded in 1946, the Italian born AGV got its start making leather seats and motorcycle saddles. In 1947, the AGV motorcycle helmet came to life. It was hand-made from a wooden mold. Today, its history in head safety is long and storied. 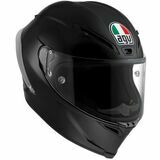 AGV started a loud buzz in 1956 with its jet fighter helmet, based on the helmets worn by jet fighter pilots. In 1967, the company introduced its full-face helmet and then in 1980 AGV introduced a helmet made with DuPont Kevlar fiber. MotoSport's line of AGV helmets includes the versatile AX-8 series for on- and off-road use and the more budget friendly MT-X series. All helmets feature several colors and/or graphic styles. 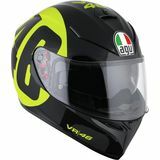 MotoSport is the best place to find AGV helmets. We provide a 90-day return policy and most orders ship same day. Use the size charts to help you take the guess work out of selecting your product. Even if a product doesn't fit, our hassle free return policy means we make it easy for you to get the right one.